UNDP has signed up with the South Asian Travel Awards (SATA) as their supporting Partner. 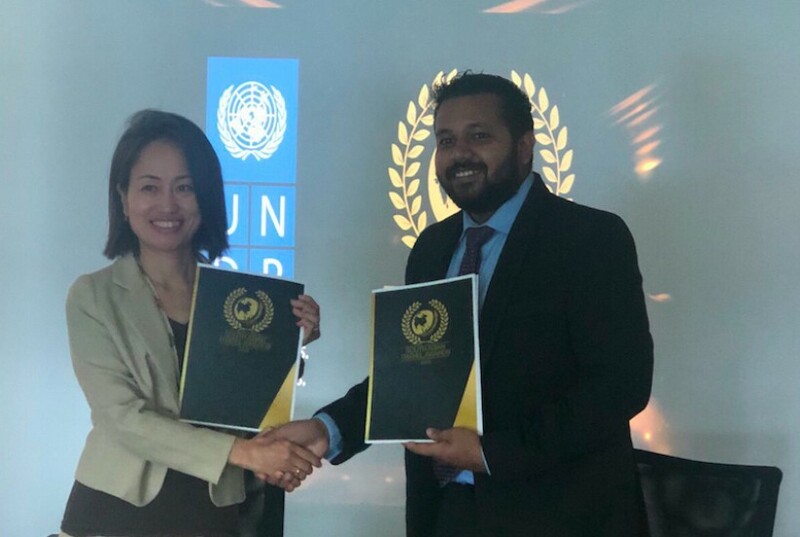 The agreement was signed by UNDP Resident Coordinator, Ms. Shoko Noda and Director Communications of SATA, Mr. Mohamed Shamin Ali. Speaking after the signing ceremony Ms.Shoko Noda mentioned to the media that it’s a great honour for UNDP to be a supporting partner of SATA and that UNDP will continue its role and assist in areas where professional support are required. Mr.Shamin revealed that a new category will be added with the consultation of UNDP to encourage in areas of industry and social development. He further stated that it’s a great honour to have UNDP as a supporting partner and SATA is privileged. Hawks Pvt.Ltd and Allied Insurance of the Maldives have recently signed up as Gold Partners of SATA 2018 while Maldives TV was appointed as a Media Partner.UAG Marketing of Sri Lanka and Asian Geographic signed up earlier with SATA as Silver Partners. Mookai Hotel from the Maldives, Ramada Colombo from Sri Lanka, The Chancery Pavilion and Udman Hotels & Resorts by Ferns N Petals from India, Hotel Mulberry from Nepal, and Zhiwa Ling Heritage from Bhutan serve as Hospitality Partners of SATA 2018. Nominations for the third edition of SATA, which consists of 36 categories in 10 segments, closed in April with a record 500 plus nominations from the Maldives, Sri Lanka, India, Nepal and Bhutan. Online voting was carried out via the official website till June 30. This years Evaluation Process was carried out in Maldives capital Male, Sri Lankan capital Colombo, south Indian City of Bangalore, Indian capital New Delhi, Nepalese capital Kathmandu, and the Bhutanese town of Paro by an all-women jury, which comprises Amal Goonetilleke from Sri Lanka, Rinku Madan from India and Hinna Khalid from Maldives. The prestigious South Asian Travel Awards (SATA 2018) will take place in the iconic property, The Taj Mahal Palace, Mumbai from 14th - 15th September 2018. Launched in 2016 by Maldives based event management company Highrise, SATA has been the most prestigious award for travel and tourism stakeholders in the South Asia region. The brand is the first of its kind with affiliations from regional associations ensuring the process to be done within a smooth and having a transparent procedure.